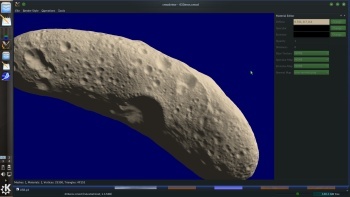 I know Celestia supports normalmaps on cmod models, which until now worked fine for my spacecraft models. But another possibility would be to use a high-resolution normal map onto a med-resolution mesh. In my vast resources of textures, I only found one good example, where I have a height texture in higher quality than a 3D-model: Dione. 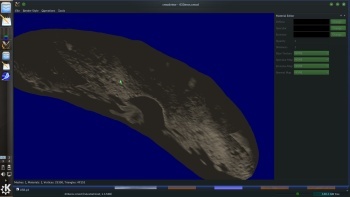 But doing the same procedure as with my spacecraft didn't work, maybe that's because the spacecraft originated from .blend files where normalmaps were already applied? Or does Celestia need them to be in this special .dxt5nm format? I have no idea how to create that. and of course no normal effect visible in Celestia besides the shading of the mesh. 2) 3D model's normals points inward. The point 1) is unclear whereas obj->Anim8or->apply texture->cmod DO make UV maps, and you have the texture displayed within the cmodview, but then you are referring of just "shading" within Celestia, that is, the model without texture. For the point 2) the "invert normals" operation must be accomplished through the Anim8or's options. i do have a 200 MiB .blend of this screenshot for baking the obj to a "displacement map"
print " Obj created - done . " then you can import the obj in "cmodview"
no that's not it, I UV mapped it as always, Celestia is able to render a texture on it, after I checked that I told Celestia not to render the texture to see the effects of the normal map better. Fenerit wrote: 3D model's normals points inward. Ok I'll try that. But I don't have to prepare the model in any other way in Anim8or for rendering a normalmap onto it? I mean the step which makes it able to display normals is done in cmodview. What am I supposed to do with this skript exactly? Run it with the console? Just adding the face count and renaming it to obj of couse doesn't work. How do I run this skript? As stated, I UV mapped the mesh, or at least I guess so. Yes the models on this site are all rotated, but that's the smallest problem. I usally load the object in Celestia and let it render body axes, so I can see how it is supposed to be rotated. Fenerit wrote: "invert normals" operation must be accomplished through the Anim8or's options. I tried edit/flip normals. The result is a psychadelic mesh that still has no normalmap displayed What operation did you mean? I haven't found something similar. Sorry, I read just now that: "I applied just a diffuse texture in anim8or". This is a bit misleading: what do you mean with "diffuse texture"? Whether you in Anim8or did apply material color for then texturing the cmod through .ssc the model still doesn't have UVmap. Instead, whether you did apply material color + texture (the Dione's one), then the cmod do have UVmap. Please, do clarify this point to me at least. For what concern the normals, the "psychedelic" effect mean that point 2) wasn't the case and the normals were right. a final question: how do you export the original mesh? If you still use .obj like swap file you do lost UVmap. Last edited by Fenerit on 10.09.2016, 09:40, edited 1 time in total. Fenerit wrote: Sorry, I read just now that: "I applied just a diffuse texture in anim8or". This is a bit misleading: what do you mean with "diffuse texture"? Whether you in Anim8or did apply material color for then texturing the cmod through .ssc the model still doesn't have UVmap. 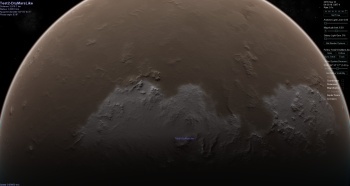 Instead, whether you did apply material color + texture (the Dione's one), then the cmod do have UVmap. Please, do look at further my question in the previous post. The image does clarify to me, thanks. Then another thing do can do is to check whether the original model is made of triangles o quads. If triangles, then do convert it in quads (I don know how the Anim8or's options behaves). Oh you mean it does make a difference if the texture is applied via cmod or ssc? When stitching the cmod together I usually erase the texture parameter, so Celestia doesn't tryhard to apply a texture on the mesh I don't want (even if that's not of any concern in this particular case). Well, I do not want to make the things confused, so I apologize whether they seems a bit messy. Yes, quads = quadrangles or quadrilaters. In Blender you can do the job in selecting Edit Mode->Mesh-> Faces->Tris to Quads to "join triangles into quads". it replaces the vertex line count with a "v" and the face count with a "f"
Fenerit wrote: Well, I do not want to make the things confused, so I apologize whether they seems a bit messy. Yes, quads = quadrangles or quadrilaters. In Blender you can do the job in selecting Edit Mode->Mesh-> Faces->Tris to Quads to "join triangles into quads". Sorry, my confusion was more due to the fact that I'm pretty much a noob when it comes to blender. I managed to join triangles to quads, but still no normal effect visible. I have no idea what this should do, since there still remain some triangles and this reduces resolution. And cmodview proves that model after converted to cmod is again made completely from triangles. Well I was using a jpg normalmap. The first image seems somewhat similar to what I get in cmodview, but not quite. Well I don’t know anything about python scripts. The cmd.exe just spits back out the script itself… If Microsoft office can do this I will do some research about how and try. So far so good... and so early suspected. The mesh doesn't have the material. The main texture, like the Dione map itself, is not the material. Do try to change the mesh color within cmodview: it will not change. Then in Blender or Anim8or you must apply the material (phong, blinn, etc., phong is raccomanded). Python scripts need Python to be installed in your system; in Win it is not shipped by default OS installation. Fenerit wrote: So far so good... and so early suspected. The mesh doesn't have the material. 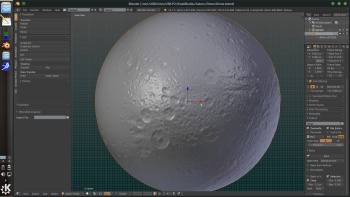 The main texture, like the Dione map itself, is not the material. Do try to change the mesh color within cmodview: it will not change. Then in Blender or Anim8or you must apply the material (phong, blinn, etc., phong is raccomanded). Again, I'm not sure what you suggest, I thought I applied the material, otherwise the texture would not even appear in Celestia? What is phong and blinn or what to do? 2) the normalmap isn't 8bit 24k resolution image. You can try by yourself to open the .obj within the cmodview. Because the utility doesn't manage the .obj material, the mesh cannot be neither texturized nor colored. None the less once applied just normals and saved as cmod, it can be shown in Celestia by assigning a texture through .ssc. But if you do convert such cmod in ASCII and do set as material the texture and then follows the usual add-ons' procedure, you will get an unexpected, strange result. As a check out on normalmap you could do this. Because the mesh seem in low resolution and below the 65k limit of the 3DS format, you could try to convert the quads .obj into 3DS format with Anim8or and then to work on this latter format in the way you've hiterto done. But if I don't UV map the mesh, then Celestia refuses to assign a texture on it. By doing so, I thought a material must be created. Fenerit wrote: the normalmap isn't 8bit 24k resolution image. If you mean 8bit RBG ("24bit") it is.PNG, no Alpha channel present. Fenerit wrote: You can try by yourself to open the .obj within the cmodview. Because the utility doesn't manage the .obj material, the mesh cannot be neither texturized nor colored. None the less once applied just normals and saved as cmod, it can be shown in Celestia by assigning a texture through .ssc. But if you do convert such cmod in ASCII and do set as material the texture and then follows the usual add-ons' procedure, you will get an unexpected, strange result. This issue might derives because triangles do not ensure continuity along the so-called "edge-loops" and therefore needs quads. FarGetaNik wrote: If you mean 8bit RBG ("24bit") it is.PNG, no Alpha channel present. This doesn't ensure that png is flattened as background image and it can be a layer into its canvas. In this case the png must be "fuse down" as background image and saved with all the png's option checkboxes unchecked. This is GASKELL Toutatis in triangular .obj format loaded within the cmodview with normals applied on it. Note how it looks white shaded but not red shaded like I've choose; in this case whichtever textures is unapplicable. Here how the above mesh looks in Celestia once converted in cmod and texturized through .ssc. (every normalmap will not work in this case). Something had not been coerent between the two methods either. I really appreaciate your help, but is it possible someone tries to get it to work in Celestia? The link to the mesh is in my first post. The normalmap is derived from John's bump map. Regarding the normalmap, ok there is evidently a difference. But I never really noticed it when using them in Celestia, they seemed just fine. Here the bumpmap I'm using and the normalmap derived from it. John, could you try if the normalmap made by nmtools is really that drasticly different? Well I probably will stick to that plugin. As a Windows user it is just a pan to use nmtools properly, I have no sufficient computer skills to get it to work and I wasted far to much time trying for nothing. Last edited by FarGetaNik on 13.09.2016, 12:10, edited 1 time in total. Don't care about that: cmodview always shows the least tassellation within its status bar. Here my workaround upon the mesh and bumps you posted, normalmap only, no main texture. The normalmap has been drawn from your bumps in Wilbur, not on GIMP. Elevation = 3. The normalmap will not work if set within .ssc; it must be set within the cmod. try to map it with your png and notice the difference. Important note: this model is as it is, I've overlooked the mesh's orientation and texture as well. Fenerit wrote: try to map it with your png and notice the difference. Important note: this model is as it is, I've overlooked the mesh's orientation and texture as well. Well that's interesting. Using just your mesh does nothing besides messing up the texture orientation, the mesh doesn't align with the texture. 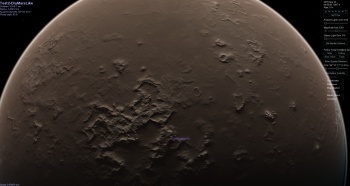 But when I deactivate the texture for Dione, it showed the mormalmap! Unfortunately the normalmap also doesn't align with the model, so there is no real point in using it. But thank you anyways. Which gave Dione a nice touch of realism.